This event is sold out. If you would like to be put on a wait list, please call Juliana Nelson at (309) 438-2495 Monday-Friday between 8:30 a.m.-4 p.m.
Get in the holiday spirit with an up close and personal experience at Cook with a Redbird Chef on November 30. 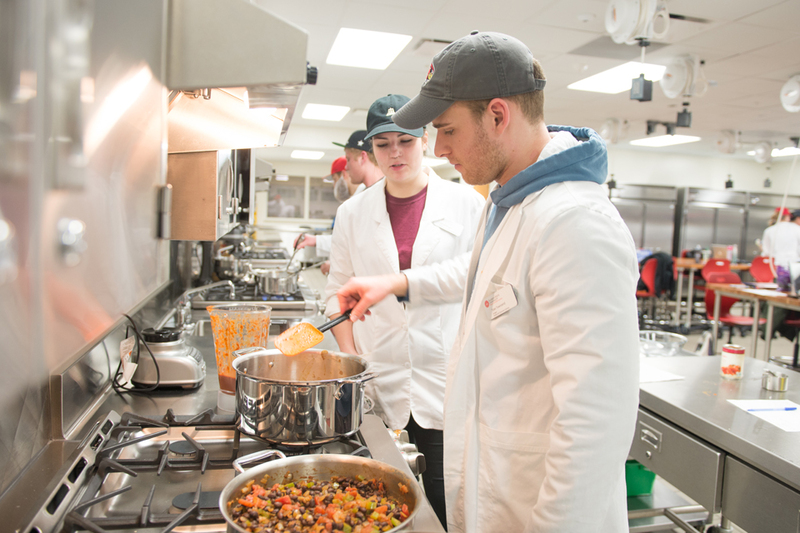 Redbirds will visit the Family and Consumer Sciences (FCS) Foods Lab to witness the talent of Illinois State students as they instruct guests on how to prepare a delicious Redbird meal fit for your holiday table. The evening will start with appetizers made by Illinois State FCS students. Dinner will then be prepared by you! Guests will receive instruction and guidance for a scrumptious meal from Executive Chef Matthew Horton and the FCS students. The menu will include salmon en papillote, risotto alla Milanese, and roasted vegetables with vinaigrette. Following dinner, dessert will be decadent when guests savor vegan fudge brownies and chocolate pudding. When the evening concludes, everyone will receive recipes for all parts of the meal to continue to cook like a Redbird chef at home for others! Cost includes all food for the evening. A cash bar will be available. A portion of each registration will also benefit the Educational Opportunity Scholarship. This event is for those 18 and older. Please include dietary needs and other accommodations during registration.